We are a leading Manufacturer of logic valve from Mumbai, India. Brand Target hydrautech pvt ltd.
We at IEE offer manufacturer Yuci Yuken offer Yuken series logic valves. These valves consist of pilot passage covers and cartridge elements. 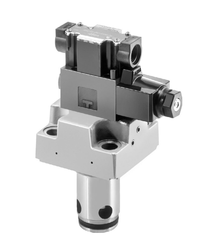 Our valves are useful for shock-less movement of hydraulic systems and rapid shifting. These valves are highly advisable for hydraulic system with high pressure, high flow rate and low pressure drop.